The Urban Action Showcase & Expo, founded by Demetrius Angelo, is the premier all-action experiential entertainment platform celebrating diversity and honoring the past, present and future multicultural achievements within the blockbuster Action genre including Adventure, Fantasy, Grindhouse, Action Horror, Sci-Fi, and Supernatural content. Cinemax® sponsors the Urban Action Showcase and Expo (UASE) in New York City. Here’s your opportunity to be seen by agents, casting directors, fight choreographers, directors, filmmakers and industry professionals. 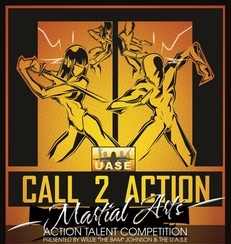 Call 2 Action Martial Arts Action Talent Competition and Branding Initiative is a joint collaboration between Willie “The Bam” Johnson and the Urban Action Showcase to Educate, Facilitate, Expose and Empower Martial Artists interested in branding themselves for the Action Film Industry. A seven-time sport karate and kung fu world champion and two-time All-American champion, Willie “The Bam” Johnson is a true hero in the world of martial arts. As the creator of Wushudo Universal Martial Arts, Johnson is known for his dynamic, universal approach to developing physical, mental and spiritual fitness. Johnson received the title of Grand Master in 1995 and is a member of the Martial Arts Hall of Fame. Professor “Bam” Johnson will be sharing the secrets of marketing your Martial Arts Talents from “The Ring to The Screen” with this exciting and informative branding initiative! Showcase your Screen Fighting skills in front of industry Stunt Coordinators and Fight Choreographers form some of NYC top Action shows! CLICK HERE FOR RULES AND MORE INFORMATION!